After the unpopular, Giugiaro-designed 860GT, Ducati’s more practical sibling to the Super Sport got a makeover into the more conservative 900GTS. The engine was largely the same, but looks were changed from the radical, forward-thinking lines to something less threatening to hidebound Ducati enthusiasts. It was still considered a bit of a let-down in terms of looks but, like all Ducatis of the era, prices are steadily rising. It’s a shame the striking 860 never caught on, but the 900 is still a very classic, handsome motorcycle, and the beating heart of the bike is still Ducati’s classic, bevel-drive L-twin. 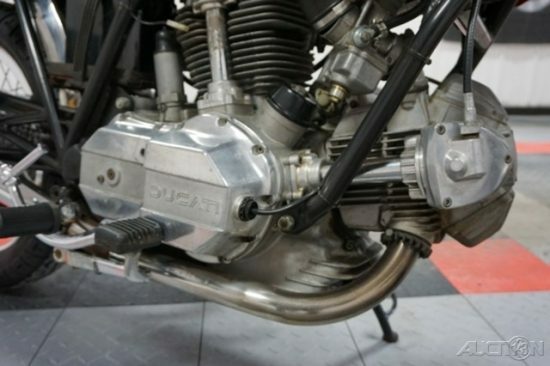 Although Ducati’s entire range of modern motorcycles feature their signature “desmodromic” actuation system that uses cams to both open and close the valves, only top-of-the-line Super Sport models used it prior to the Pantah engine. So although the GTS does have a set of tower-shafts and bevel-gears to drive the overhead cams, it makes do with a set of ordinary valve springs to close the valves. Impact on performance is negligible and the bike still put out 65hp and plenty of midrange torque. Today we are proud to offer this beautiful vehicle for your consideration. This is a terrific addition to any enthusiast’s collection. 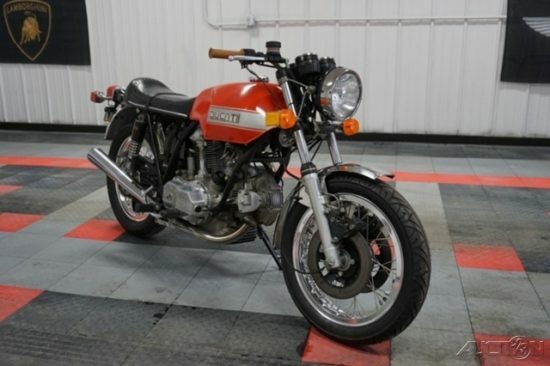 This Ducati is completely original and has been locally owned for the past 38 years in heated garages. Every electrical component such as headlights brake light, Turn signals and horn perform. New tires along with new rims and wire wheels. Fenders and tank are original and without any dents. Electric start is immediate. This bike with the Conti exhausts sounds identical to the SS. It has amazing torque. 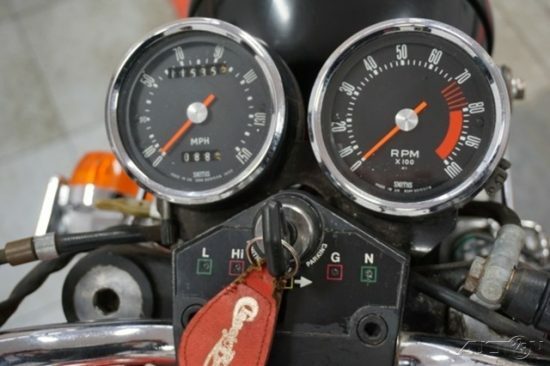 Included are the following 2 bar end mirrors (new), 2 new chrome valve guides (current ones on bike are rusty), manual, tool kit with under seat compartment. A few service records are included. This vehicle is running properly. It performs wonderfully, whether you’re in-town or on the open highway, and exhibits excellent road manners at all speeds. This is a great previously owned vehicle. Overall the vehicle is very straight. The condition of the paint and body, is in overall good shape, see photos. 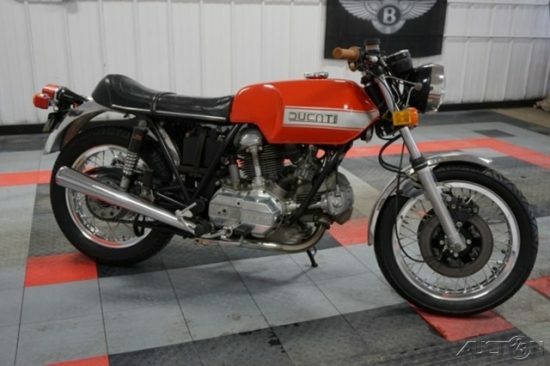 This is a rare opportunity to own a legendary 900cc Ducati! Originality is very important to many collectors. 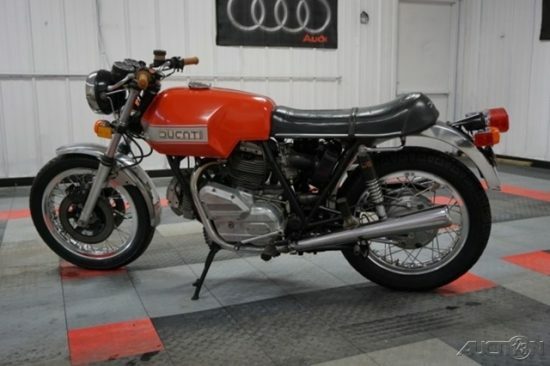 As they say, “It’s only new once!” And although this Ducati is a little rough around the edges, it has tons of character and appears to have been well-maintained, even though the cosmetic aspects have suffered a bit from the ravages of time. The missing side-panels might be difficult to replace, although pattern parts should be available if you spend some time browsing the interwebs. The fact that all the basics work is key, considering that bidding is only up to $8,350.00 with the reserve met. Bidding is active, but if the price stays reasonable, this could prove to be an excellent candidate for a “rolling restoration,” a bike that you can either ride as-is or work on a bit at a time to make it look brand new.